this one are done in dusty pink and trimmed with some pretty pink cotton lace and ruffling. They share a spot on the bed with this little pillow I did years and years ago. That one is hand appliqued and hand quilted. This is done in the more traditional muslin and matching thread. It is actually a pattern for a quilting design. The colonial knots are so much better than french knots - or that is my opinion - because they never pull through to the back. Once you have mastered the movements, you don't forget how to do one. I like this one a lot. Amazed that I did a pretty good job on the satin stitched grapes. That stitch is time consuming but very pretty. Wonder if candlewicking will make a comeback? It's very pretty handwork. As always, your work is beautiful. I just discovered a candlewicking pillow kit in my stash. No telling how old it is. It is a very simple one without satin stitch. I've never tried it before. Is it difficult to learn? Beautiful! I made some pillows too! I remember when it was the craft to do...who knows--- as the saying goes... what comes around goes around again! Your pillows are really pretty--such a delicate feel! I'm betting it'll make a comeback--doesn't everything sooner or later! I made a candlewick baby quilt for my niece and never did it again! I was thinking about it recently though and sort of wish it would come back. Your projects are lovely! Wow! your handwork is absolutely perfect! You should enter those in a fair and win 1st Prize!!!! I would love to know where your pattern is from. Your work is quite lovely. I would love to know where your pattern is from. Your work is just lovely. 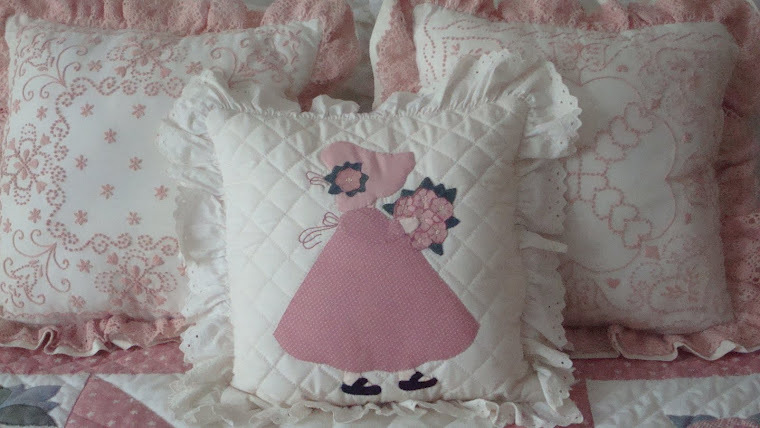 Do you know how or where I can get the pattern for the two beautiful candlewicked pillows shown above? I want to make them for my niece that will be here in the summer. They are beautiful!